The one day seminar works like this. A pastor or organization's leadership contacts us. We confirm a date. Next is our arrival in the morning to prepare for the seminar which could start at 9 am. We will teach students how to read Biblical Aramaic. Then, they will learn some basic vocabulary and grammar. They will learn to use Biblical computer programs thus putting their new found knowledge to work enabling the student to write sermons and Bible studies. The seminar could finish at 4:00 pm. Do you desire to have a better understanding of the New Testament? Sure you do! We all desire to know Jesus Christ better. The New Testament was written in Greek. The inspired Word of Jesus is in Aramaic or Greek, not English. All Christians need an understanding of Biblical Aramaic. Now there is 'Aramaic in a Day'© which is a one day seminar. The seminar is taught by Dr. and Sister Klein. 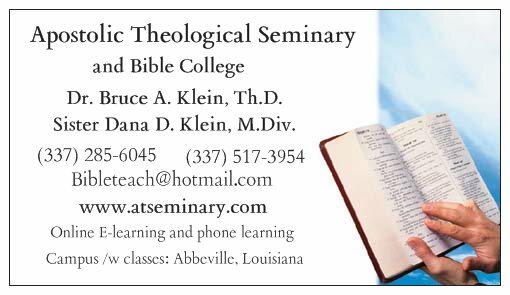 Dr. Klein has written a couple of booklets on Biblical Aramaic. 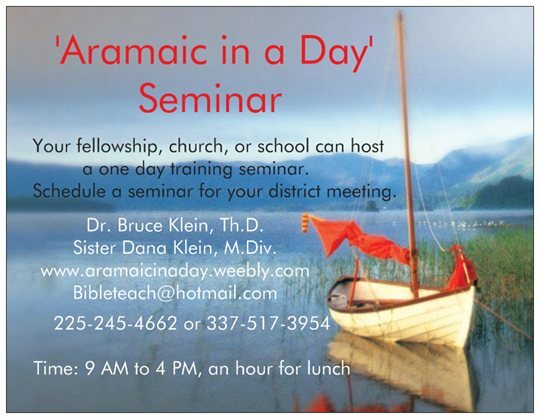 Call today to schedule a 'Aramaic in a Day'© seminar. There are many, many times Aramaic is needed to clarify or correct the English Bible. Dr. Klein started teaching the Holy Bible to neighborhood kids at the age of nine. 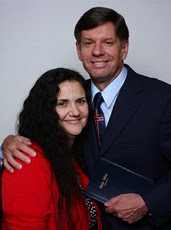 He has pastored, taught English at Berlitz International Language School, taught high school English and university English, etc. He taught Biblical Greek at Muskegon Bible Institute and Seminary. He has written a Greek grammar, plus over twenty books. Every pastor needs to know Aramaic, Greek and Hebrew! Dr. Bruce A. Klein, Th.D.